Stride addresses alarming high school drop out rates in the NYC Public School system at the source by keeping students in school, and encouraging participation in education beyond graduation. Students are eligible to apply for the Stride Scholarship at the end of the first semester of their freshman year of high school. By awarding the Stride scholarship at the freshman level, the student can focus on excelling in high school and beyond, secure in the knowledge that their hard work will pay off upon graduation. Each student will also have the support and guidance of Stride appointed mentors throughout their high school career. Additionally, Stride requires that selected students participate in community service and internship opportunities throughout their high school years. This approach allows students to give back to their communities, while investing in their own futures. Stride focuses on children living in high poverty/high risk communities by providing them with financial and emotional aid toward gaining a higher education. By providing these opportunities, Stride is creating leaders who will ultimately better their communities by representing the successes of a good education and encouraging others to follow in their footsteps. Stride’s program is designed to support and encourage high school students by identifying and eliminating obstacles for completing high school as early as their freshman year. Research shows that making these connections and providing support to high-risk students early in their high school career is more effective in improving graduation rates. Stride helps students secure their futures by creating incentives to successfully graduate and move on to college. Participants in Stride will invest in their own futures, while giving back to the community through volunteer and internship opportunities. They will obtain job skills that will help focus their interests as they pursue higher education opportunities. Through volunteer work, they will gain essential life skills that will help make them feel like a contributing member of their community. This approach provides a direct link between the investment that they are making in themselves and the reward of earning scholarship funds for college. An essential, core life lesson is learned as a result. 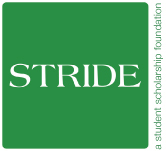 STRIDE is a high school scholarship program concept conceived by Chloe Kaplan Hall in 2007. Fully aware of the disconnect between students in urban high schools and their understanding of the future awaiting them in college, Chloe developed a program that would not only support students’ efforts to successfully complete high school, but also assist them in being able to attain college degrees. 2008 proved to be a big year for Stride. Chloe welcomed friend and fellow New Yorker, Sabina Breece, to the project and together they were able to grow Stride to the burgeoning non-profit that exists today. Over the course of that year, the girls teamed up with Washington Irving Public High School in NYC’s Union Square to recruit the first class of students. Additionally, Chloe and Sabina worked tirelessly to compile all the forms and documents necessary to not only incorporate Stride but to get 501c3 status – making Stride a legitimate not for profit foundation just as the year came to a close. In the winter of 2009, Stride Leadership and Washington Irving High School faculty selected the very first class of students into the program; two high school freshman students with incredible drive and promise. Today, Stride boasts a dedicated board of six dynamic individuals, all of whom works diligently to engage and educate the community in efforts to raise funds for future students. Freshmen high school students at Washington Irving High School in New York City go through a formal application process for a scholarship award. Stride leadership and Washington Irving faculty determine which students are most deserving and qualified for the program. The students enrolled in Stride will receive their scholarships if they graduate on time with a satisfactory GPA, complete their internships successfully, and participate in the community outreach made possible by the program. The Stride Scholarship is a partial-tuition, four-year scholarship worth approximately $16,000.